The gem-size photograph that appears on the inside front cover may have depicted Nettie herself. The first inscription in the album was made by Ella J. Fletcher at West Brookfield, Massachusetts, on December 25, 1879. Perhaps the album was a Christmas present from Ella to Nettie. The album measures approximately 8" by 5" and contains the sentiments of over 70 of Nettie's friends and schoolmates at Warren, Massachusetts, and at the Northfield school. Two of the students were from China. An alphabetical surname list and an alphabetical list of the inscribers, together with any personal information they offered, appear at the end of this post. 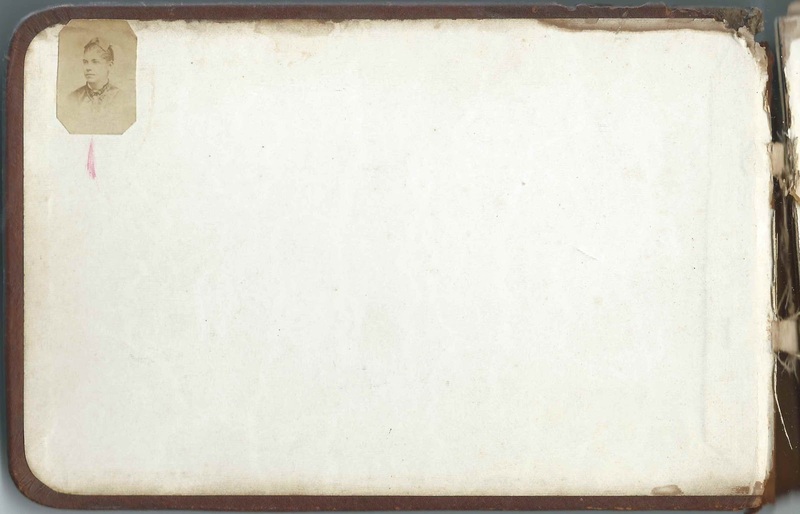 Several people affixed gem sized photographs to their pages, such as Marcia M. Laflin of Warren, Massachusetts, who inscribed her page on December 25, 1879, the day that Nettie apparently received the album. Additionally, Nettie added an occasional note about the inscriber's death. In one case, she pasted a newspaper clipping announcing the August 14, 1882 death of inscriber Stephen Rowan of Kensington, London, England, who had come to the United States to seek his fortune and inscribed a page on July 17, 1881. 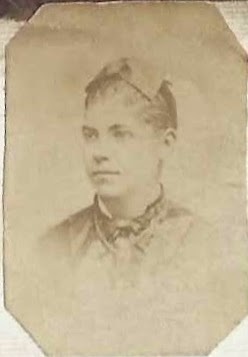 I found several Netties from the Warren, Massachusetts, area, but the one who seemed to fit best with the birth dates of several other students, was Nettie Eliza Brooks. 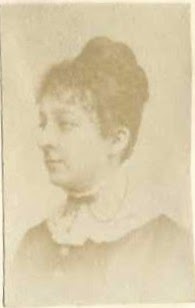 This Nettie was born October 3, 1863 at Warren, Massachusetts, the daughter of William Brooks and Mary E. (Taintor) Brooks. Hopefully a reader will have more information on Nettie Eliza Brooks or will have an alternate theory as to Nettie's identity. Additionally, if you have information to share on any of the people listed below, please leave a comment or contact me directly. Several people inscribed pages in England, including at Southport and Manchester in Lancashire and and Shipley in Yorkshire. Presumably Nettie visited there about 1883. 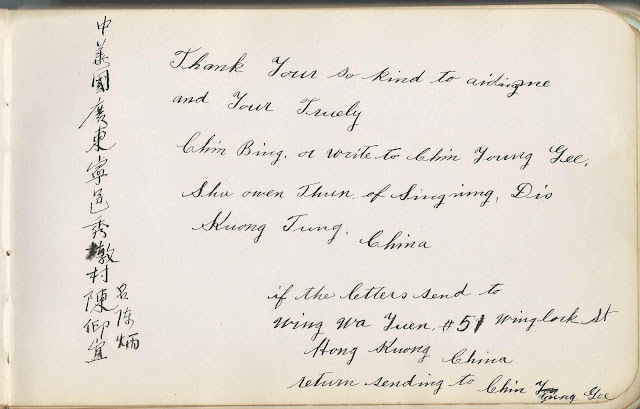 The pages inscribed by the Chinese students, who called themselves Chin Young Lee of Kuong Tung, China, and Chin Kue, native of Sing Ning District, Juong Tung Province, China, who inscribed his page at Mount Hermon School in 1888. 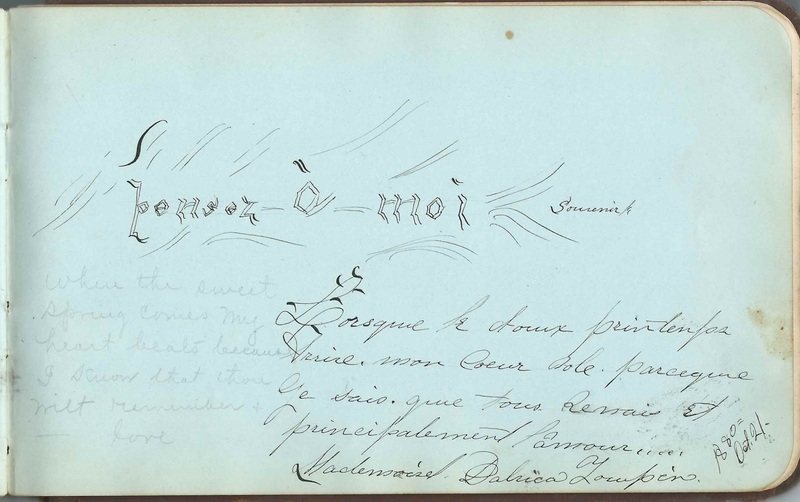 I could use help with this page inscribed in French on October 21, 1880, either by someone from a French-speaking country or by a student in French class. Gem sized photograph of an unidentified young man - no inscription on the page. Hand drawn and colored flower and initials, possibly A. C. or C. A. Sketch of Two Women and a Man on a Porch. Door has medallion with initials "J. E. B." Entitled: "Have a bite?" Another page, not adjacent but close, by Frank N. Dewey of Brooklyn, New York, inscribed on August 8, 1884, also has the phrase "Have a bite"
Dora; inscribed at Warren, New Hampshire, on February 5, 1880 at 8:15 A.M.
E. W. Atwater; inscribed on July 10, 1884. He also stamped his name. Ella R. Brainerd of Holyoke, Massachusetts; inscribed in April 1884. Presumably Ella Rebecca (Savage) Brainerd, whose husband George Wilson Brainerd inscribed the right facing page. G. W. Brainerd of Holyoke, Massachusetts; inscribed on April 15, 1884. Presumably George Wilson Brainerd, whose wife Ella Rebecca (Savage) Brainerd inscribed the left facing page. Mrs. R. R. Brown; her husband R. R. Brown of Holyoke, Massachusetts, inscribed the right facing page. R. R. Brown of Holyoke, Massachusetts; draw two sketches, one of an arrow with scroll and the other of a hissing cat "Me-ow!!! oft in the stilly night". His wife Mrs. R. R. Brown inscribed the left facing page. 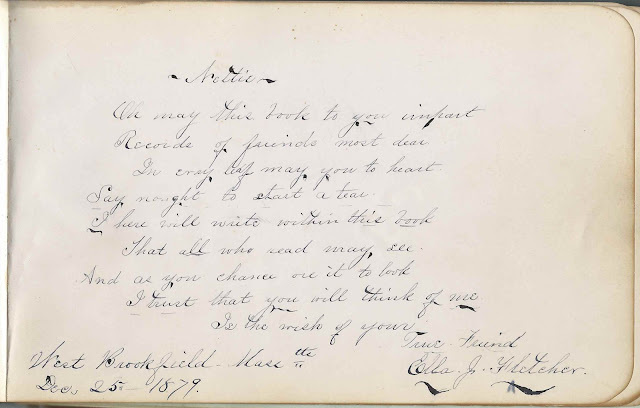 C. A. Butterfield of Seneca Falls, New York; inscribed at Holyoke, Massachusetts, on January 10, 1884. "Gay young frizzle tops one, two, three, Could there anything happier be?? Ella and Nettie and Addie so fat, Sleeping so cosily right at the back"
Grace Lillian Curtis of Boston, Massachusetts; inscribed on July 22, 1880. She included a gem sized photograph of herself on the page. Charles A. DeLand of Warren, Massachusetts; inscribed on July 31, 1880. He pasted a gem size photograph of himself on his page. Frank N. Dewey of Brooklyn, New York; inscribed on August 8, 1884. In upper left hand corner he wrote" Have a bite". Could he be the artist of the similarly named sketch? Ella J. Fletcher; inscribed at West Brookfield, Massachusetts, on December 25, 1879; presumably Ella presented the album to Nettie as a Christmas present. Ned H. Fowler of Westfield, Massachusetts; inscribed on January 2, 1887. "W.A.P.L." Eugene S. Laflin of Holyoke, Massachusetts. His wife, Emma S. (Conner) Laflin inscribed the right facing page. Emma S. Laflin of Worcester, Massachusetts; inscribed at Holyoke, Massachusetts, on May 14, 1881. 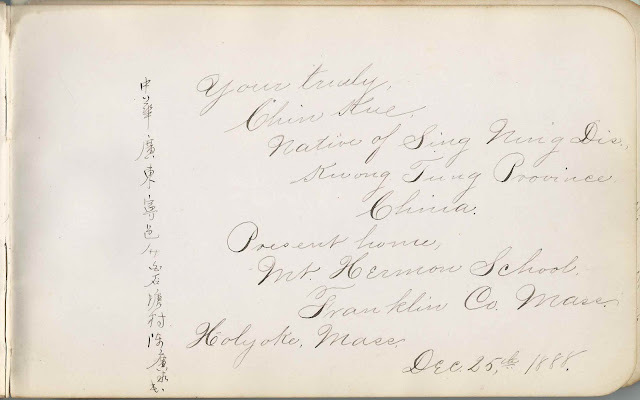 She was Emma S. (Conner) Laflin, whose husband Eugene S. Laflin inscribed the left facing page. 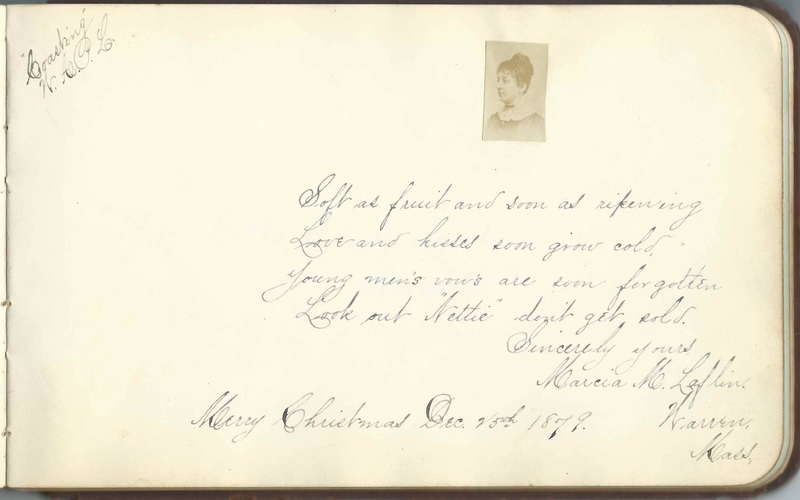 Nettie's note: "Died Nov 28/89"
Marcia M. Laflin of Warren, Massachusetts; inscribed at Christmas Day, December 25, 1879. 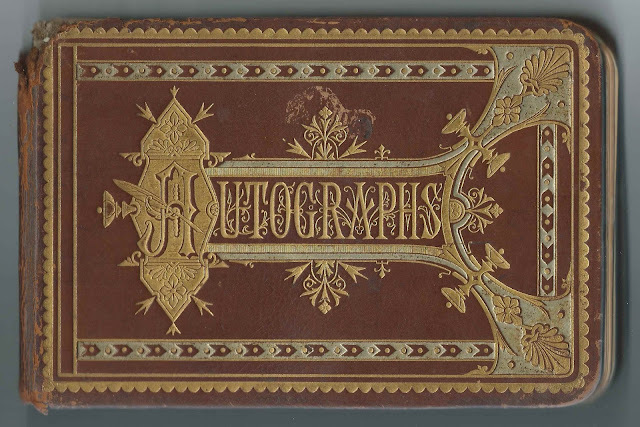 Marcia's brother Eugene S. Laflin and his wife Emma S. (Conner) Laflin also inscribed pages. "Coasting W.A.P.L." Marcia pasted a gem size photograph of herself to the page. James S. Lassiter of Oxford, North Carolina; inscribed on 1/4/85. His sentiment: "Laughter 'tis a poor man's plaster, Covering up each sad disaster". Jennie B. Mann, of Worcester, Massachusetts; inscribed on December 9, 1882. "4 in A Bed". Presumably Jennie B. (Weir) Mann, whose husband Charles O. Mann inscribed the right facing page the year before their 1881 marriage. C. O. Mann of Fall River, Massachusetts; inscribed on December 26, 1880. Presumably Charles O. Mann, whose wife Jennie B. 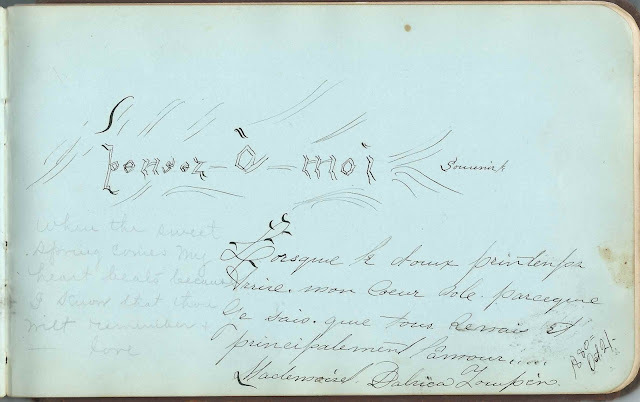 (Weir) Mann inscribed the left facing page after their marriage in 1881. Alice E. Mayo of Needham, Massachusetts; inscribed on February 6, 1882; colored hummingbird drawn on the page. M. M. Patterson of Worcester, Massachusetts; inscribed on March 28, 1880. He pasted a gem sized photograph of himself on the page. Possibly Mark M. Patterson. "When this you see you will bee [sic] sure to think of the night I fell down at the Skating Rink. 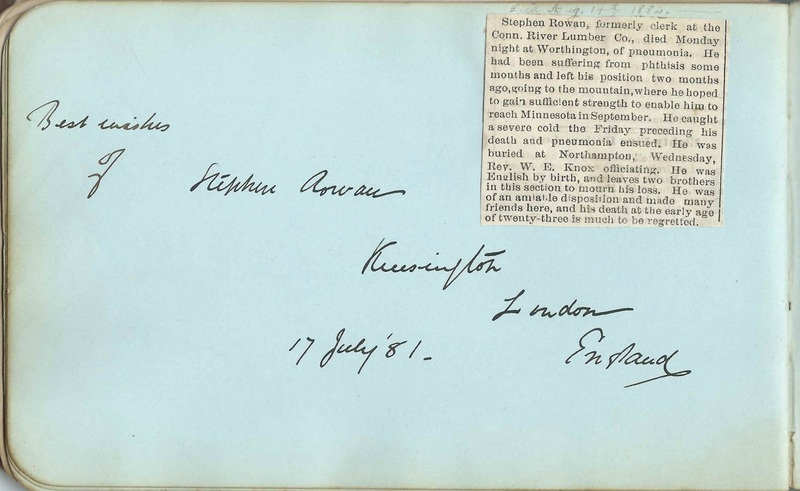 Stephen Rowan of Kensington, London, England; inscribed on July 17, 1881. Nettie, presumably, pasted a newspaper clipping about Stephen's death and added his date of death: "Died Aug. 14th 1882". 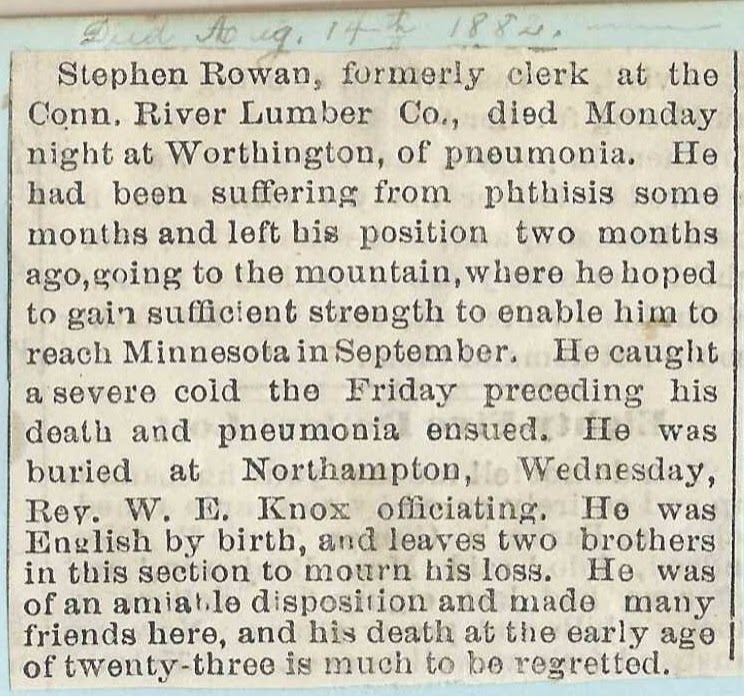 Stephen Rowan, formerly clerk at the Conn. River Lumber Co., died Monday night at Worthington, of pneumonia. 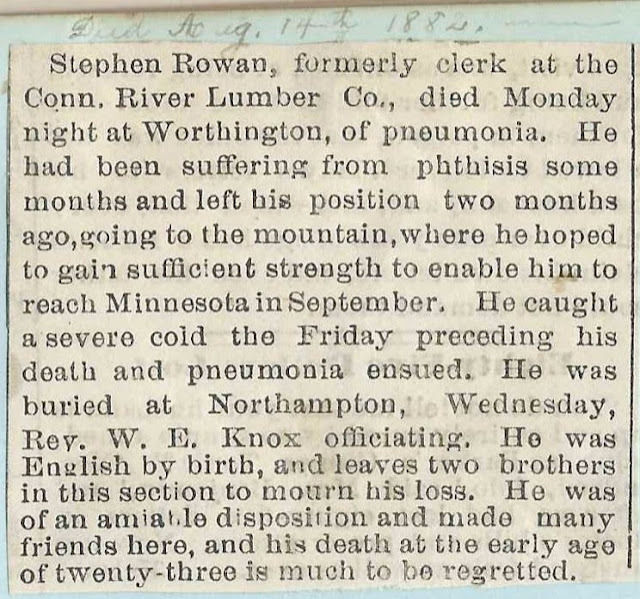 He had been suffering from phthisis some months and left his position two months ago, going to the mountain, where he hoped to gain sufficient strength to enable him to reach Minnesota in September. He caught a severe cold the Friday preceding his death and pneumonia ensued. He was buried at Northampton, Wednesday, Rev. W. E. Knox officiating. He was English by birth, and leaves two brothers in this section to mourn his loss. He was of an amiable disposition and made many friends here, and his death at the early age of twenty-three is much to be regretted. Is the page with initials J.E.B. pictured? I couldn't find it. Thanks! I do have it but, for space considerations, I can't put all of the images on the post. You will find my email address under Inquiries near the top of the right margin - I'll be glad to send the image to you once I receive your email address.